The ancient Cotswolds market town of Tetbury is a bustling and thriving place with a wide choice of accommodation, shopping, places to eat and visit in the surrounding area. Tetbury town is situated on the Wolds rather than beneath and therefore prevented it from becoming a great woollen milling centre like Stroud. Tetbury is only several miles away from places like Nailsworth and Minchinhampton in the north and Malmesbury in the south. Retreat to The Cotswolds for the ultimate escape from everyday life. At The Hare and Hounds, no day is ever the same and no words will ever quite do it justice. Say we’re a traditional country hotel in the heart of The Cotswolds and you’d be on the right track. Continue through the historic market town of Tetbury, spot a royal on route just up the road at Highgrove (Take a look at our Highgrove Garden Tour packages) or take a pit stop and try your hand at polo at the local Beaufort Polo Club (spy another royal playing chukkas). Admire the 15,000 types of tree at Westonbirt Arboretum, before falling upon the unique character and special charm of our magnificent Cotswold hideaway. With a warm, personal service in a home away from home, you really don’t have to lift a finger. Trust us, you’re going to love it. The Hare and Hounds resides in it’s own secret wilderness of natural beauty. Imagine hidden pathways through secret archways surrounded with blossoming overlays of wild flowers that lead on to manicured lawns – perfect for a knock-around game of croquet or a snooze in a deck chair. Come inside and sink into a cosy armchair by the fire, partake in a board game in The Drawing Room or snuggle up and pick up some tips from Jilly Cooper’s Polo in The Library. Enjoy a glass of wine in the vibrant surroundings of The Beaufort Lounge. After an indulgent dinner in our 2 AA Rosette Restaurant, stroll into our wonderfully designed bedrooms, all dressed with comfort and themed to celebrate the beauty of our surroundings. There’s so much more to say, so we suggest you come and stay and let us show you as you sit back and relax at The Hare and Hounds. Come on in and take a seat. Let us welcome you to The Close Hotel. A picture of English splendour, this former 16th century town house is a country hotel like no other. Pop your phone on silent and let us show you why – for starters, it’s all about you; your stay, your enjoyment – everything revolves around you. Switch off, snuggle up and look out from one of the big windows – a brilliant spot for a bit of people watching. You may even spy the odd royal with Highgrove and Gatcombe located just up the road. Observe the world go by as visitors stroll around Tetbury’s historic market place and indulge in the town’s boutiques and renowned antique shops – Tetbury is a mecca for collectors from around the world. We look forward to welcoming you whether it’s with a drink in the bar, a plate of good food in The Brasserie or a spot of fine dining amidst the flickering candlelight of The Dining Room. 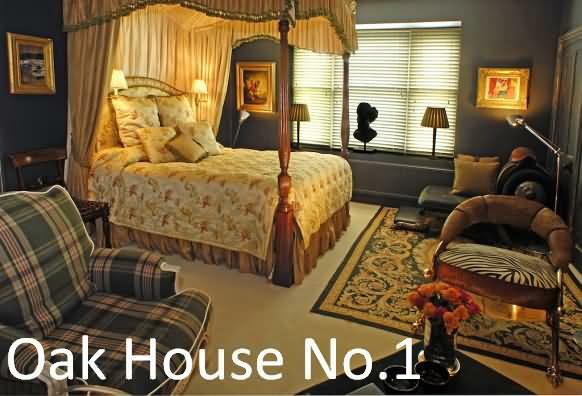 Venture upstairs to a comfortable bed in one of our beautiful rooms; you have 18 to choose from, each completely different but equally appealing. Come for a few nights and relax, fall in love and stay for a few more. The prices below are our standard published rates. These rates can vary greatly throughout the year. To ensure you get the best rate please click the ‘Book Now’ button on our website. Showcasing a spa center and sauna, Calcot Manor Hotel is located 3.8 miles from Tetbury, just 3.4 miles from Westonbirt National Arboretum and 5 miles from Highgrove House. The hotel has a seasonal outdoor pool and terrace, and guests can enjoy a meal at the restaurant or a drink at the bar. Free WiFi is provided and free private parking is available on site. The Calcot Spa team will do whatever they can to make sure you have everything you need and that every detail of your visit is taken care of. The building is lovely, the lavender-lined outdoor hot tub and open fire is inviting and of course the healthy menu is delicious – but most importantly, the spa and the team are exceptional. You will have a great time. You can play tennis at this hotel, and free use of bicycles is available. The hotel also provides car rental. 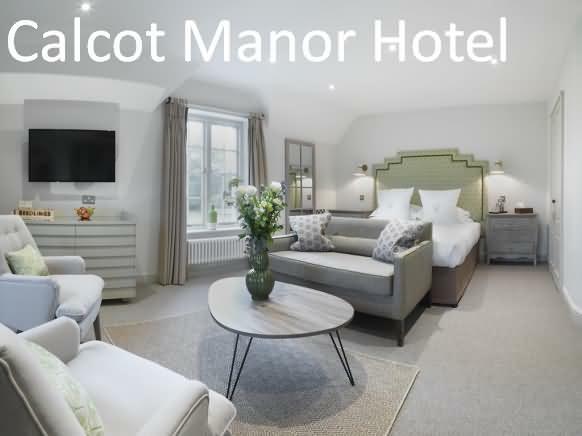 The nearest airport is Bristol Airport, 27 miles from Calcot Manor Hotel. The high-quality boutique hotel Oak House No 1 in Tetbury has been featured in Conde Nast Traveller, Tatler and Sunday Times Style magazine. With sumptuous interiors, concierge service and designer furnishings, this Gloucestershire hotel provides free Wi-Fi and parking. Rooms feature beds dressed with linens from Frette or Ralph Lauren and cashmere throws. Each room has satellite TV with the full range of Sky channels, an iPod dock, DVD and CD player. A silver tea set comes with coffee and hot chocolate, and a fridge keeps your fresh milk and bottled water cool. Bathrooms have luxury Molton Brown toiletries, with hairdryer and bathrobes supplied. 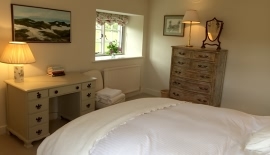 Each room has an electronic safe and a range of bespoke furnishings. Oak House No 1 has played host to rock stars and royalty, and can arrange activities such as polo lessons and services including classic car hire. A short distance from the royal Highgrove Estate, Tetbury exudes Cotswolds charm and features plenty of fine restaurants, antique emporia and Prince Charles’ very own Highgrove shop on Long Street. 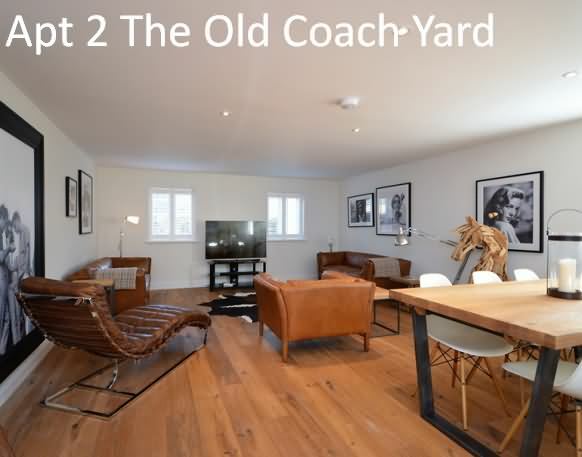 This property also has one of the top-rated locations in Tetbury! Guests are happier about it compared to other properties in the area. 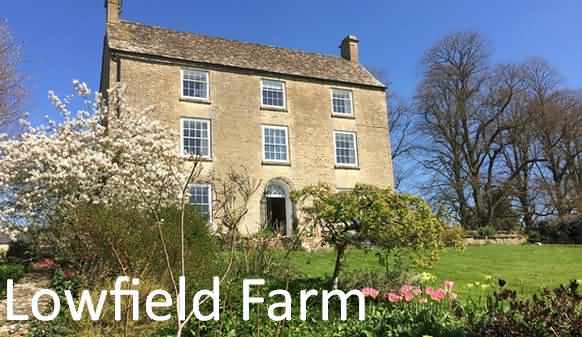 Lowfield Farm is a mile outside Tetbury, down a long farm lane, set in its own 50 acres of meadows and woods. 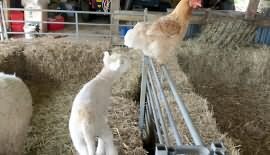 You can wander all over the farm to visit our sheep, alpacas and chickens. Or just sit in our beautiful garden and enjoy the peace and quiet. You will have the whole top floor of our house to yourselves (2 bedrooms and a bathroom). We only ever book one party at a time. Prince Charles' residence, Highgrove, is just down the road - organic produce from the farm can be bought nearby, but to visit the fabulous gardens you need to book ahead on their website. Their store in Tetbury sells many great gifts. Westonbirt Arboretum is a short hop and a wonderful day out for Spring and Autumn colours, learning about thousands of tree species or simply walking in natural woodland. Visit Chavenage House - the film location for Poldark, Tess of the d'Urbervilles and Lark Rise to Candleford. This is a family home that opens its doors to the public several days a week. Tetbury is in the heart of the Cotswolds and a perfect base for visiting the Cotswold villages or enjoying the local walks. There are many public footpaths all around, and one passes close to Lowfield Farm. We are an easy drive from Bath (Roman Villas, Assembly Rooms and great shopping), Bristol (SS Great Britain, the harbour and music events) or exploring beautiful South Wales such as Tintern. 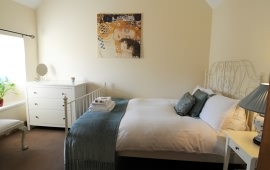 Tariff - £95.00 per night for 1 Twin / Double Room including breakfast. Set 1.7 miles from Westonbirt Arboretum and 3.5 miles from Tetbury. The Glasshouse Westonbirt is located within a listed walled garden, featuring free WiFi access and free private parking. It is 3.5 miles to Tetbury. The National Arboretum is 1.7 miles away, while Highgrove House and Beaufort Polo Club are both within 1.9 miles from the property. 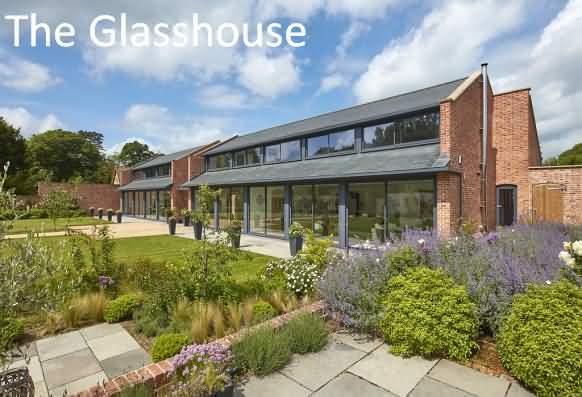 The Glasshouse is a contemporary Manor House designed to bring the garden and house together with copious amounts of light, even on the dullest of English days. Situated within a listed walled garden, marrying old and new, to create a peaceful and tranquil hideaway with views over woodland. The rooms are fitted with a flat-screen TV. Certain rooms have a seating area where you can relax. Each room comes with a private bathroom. For your comfort, you will find bathrobes, slippers and free toiletries. You will find babysitting service at the property. There is also a swimming pool and gym next door. You can engage in various activities, such as golfing and hiking. Bristol Airport is 27.3 miles from the property. 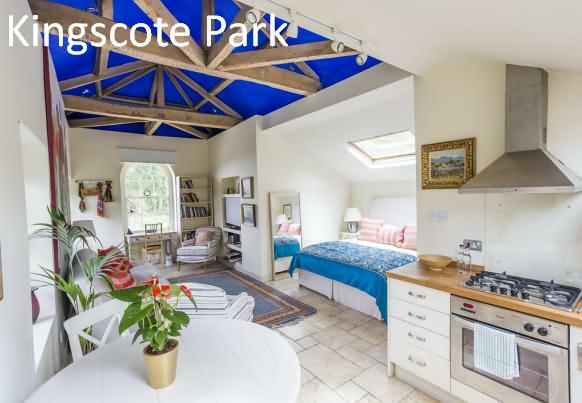 Kingscote Park Accommodation is located in Tetbury, 5 miles from Westonbirt Arboretum and features a garden. This bed and breakfast offers free WiFi. Guests can enjoy garden views. All rooms at the bed and breakfast come with a TV and a kitchenette. The rooms have a coffee machine, while some have a patio. The rooms at Kingscote Park Accommodation are fitted with a seating area. The nearest airport is Bristol Airport, 26.7 miles from the accommodation. Christmas Cottage is to a very high standard creating a pleasing co-ordinated interior full of pictures, books and plants; drawing on the owner’s years of experience bringing old houses ‘back to life’ and running an interior furnishing business. Ideally located on Gumstool Hill, a once busy thoroughfare, being minutes from the centre, but now very quiet due to gates closing one end. Except on Woolsack Day of course! The cottage accommodates four adults maximum. One double room and one twin bedded room (this can be converted into a King Size double if preferred). Both rooms are full of sunlight by day and quiet by night. Large sitting room has wood burner, free sat TV, DVD library, DAB radio with iPOD docking and CD s. A spacious contemporary kitchen with stable door to garden. A luxurious, large bathroom with double ended bath with rose head power shower over. Soft towels and lots of toiletries to try. A welcome cake laden tea tray awaits you. SHORT BREAKS from £150.00; WEEKLY from £245. 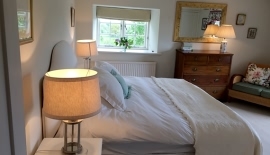 Turnpike Cottage is a charming, detached and recently restored cottage overlooking Tetbury Church and Tetbury Old Town and is just minutes walk to the Town Centre and all the facilities Tetbury has to offer. The larger of the two double bedrooms is a family room with double and single beds and there is a sofa-bed in the sitting room. Up to seven people can sleep at the cottage but it would be more luxurious and spacious for four/five. There is off road parking for two cars. The cottage is equipped to a high standard with a recently fitted kitchen/breakfast room, utility room and a downstairs loo. 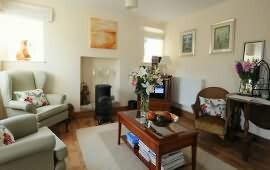 The sitting room is a generous size and is extremely comfortable and homely. The bathroom is also recently fitted with bath and separate shower. The garden is laid to lawn with decking at the end of the garden to enjoy the beautiful views of Tetbury. The cottage facilities include: Fully equipped Kitchen/Breakfast Room with Dishwasher, Washing/Drying Machine, Oven, Microwave and Refrigerator. 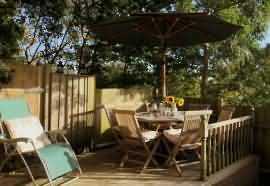 There is also a Travel Cot, Linen and Towels are provided, TV, DVD player and Stereo with a selection of CD's and DVD's, Iron and Ironing Facilities, Complimentary Guest WiFi, Garden with Garden Furniture and Barbecue. Turnpike Cottage can be let for weekends as it is ideal accommodation for wedding venues in the area. 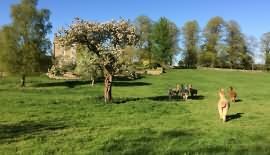 We are a short walk to The Great Tythe Barn, Tetbury and a short drive to Chavenage House, Westonbirt, Calcot Manor, The Matara Centre and Kingscote Barn (minimum stay is 2 nights). Turnpike Cottage is also perfect as an extended holiday base for guests who wish to tour The Cotswolds and the surrounding areas (e.g. Bath, Bristol and The Forest of Dean). There is a No Smoking and No Pets Policy in place at Turnpike Cottage - see our website for pictures and information, thank you. a weekend (2 nights) and £800 for up to five guests for a week. Peacefully tucked away within the back lanes of Tetbury and just a few minutes’ walk from the centre of this thriving market town. Beautifully furnished with a contemporary style creating the perfect base for a relaxing break in the Cotswolds. This thriving market town built around its outstanding seventeenth-century market hall, offers a unique experience with many individually owned shops, a major centre for antiques, along with many restaurants and bars. On the outskirts of Tetbury is Chavenage House, an Elizabethan Manor house and nearby the National Arboretum at Westonbirt. The Cotswold Water Park, offering a wide range of nature activities and water sports. The famous Wildfowl and Wetlands site at Slimbridge and Berkeley Castle are also within easy reach. With many events throughout the year to include Cheltenham Gold Cup, Cirencester Polo, Badminton horse trials, Highgrove House and Gatcombe Park. 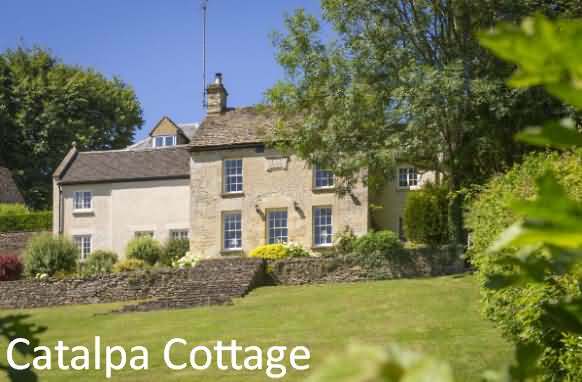 Catalpa Cottage is a detached 19th century Cotswold cottage set in a quiet corner of Tetbury yet only a three minute walk from the centre. It is set in an elevated position above a one acre private garden. The garden comprises a patio terrace, a wonderful, large sloping lawn and two ponds surrounded by a low fence. This is the perfect place to unwind and enjoy a truly relaxing holiday. Situated in the Cotswolds in an Area of Outsanding Natural Beauty, Tetbury is a thriving market town built around a 17thcentury Market Hall. It has elegant buildings and offers a unique retail experience with many individually owned shops and as well as being a major centre for antiques. One bathroom, one en-suite shower room. Charming, large garden including sloping lawn and two ponds (unfenced, please ensure children are supervised). Parking is available for two vehicles - please see property layout. 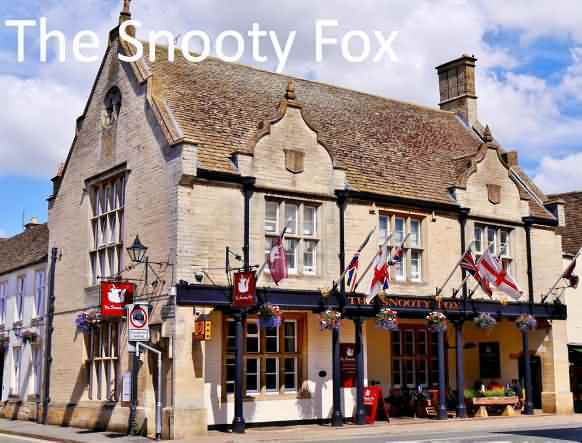 The Snooty Fox is set in the heart of the market town of Tetbury and offers en-suite rooms with traditional décor and free WiFi access throughout. The property features an on-site bar, a restaurant and a terrace. Rooms at The Snooty Fox are spacious and include a seating area, a TV and tea and coffee making facilities. Each room comes with an en-suite bathroom with a bathtub and a hairdryer, and bathrobes are provided. Some rooms feature a spa bath. A full English breakfast is served every morning in the common breakfast area and a variety of British specialities is available on the inn's restaurant for lunch and dinner. Guests can get drinks and refreshments in the property's bar or on the terrace throughout the day. The centre of Gloucester is 23 miles from The Snooty Fox and Bristol is a 45-minute drive away. You can visit the Welsh city of Cardiff, located 55.9 miles from the accommodation. 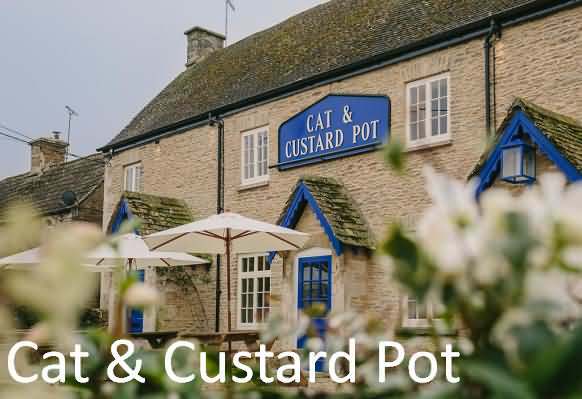 Featuring free WiFi and a restaurant, Cat and Custard Pot Inn offers pet-friendly accommodation in Shipton Moyne, 17.4 miles from Bath and 2.2 miles from Tetbury. There is a water park on site and guests can enjoy the on-site bar. Free private parking is available on site. A three-mile radius encompasses Westonbirt Arboretum and Westonbirt school, Highgrove gardens, and the Beaufort polo club. Badminton and Gatcombe horse trials are both within easy reach. We are 24 miles from the Roman spa town of Bath and from the city of Bristol, both with their many attractions. Cheltenham races are 34 miles from the Cat. The rooms have a flat-screen TV. All rooms are equipped with a private bathroom. For your comfort, you will find free toiletries and a hairdryer. All rooms have been individually decorated with antique furniture. You can engage in various activities, such as horse riding, cycling and fishing. Bristol is 21.7 miles from Cat and Custard Pot Inn, while Cheltenham is 20.5 miles away. The nearest airport is Bristol Airport, 28 miles from Cat and Custard Pot Inn. This property also has one of the top-rated locations in Shipton Moyne! Guests are happier about it compared to other properties in the area. 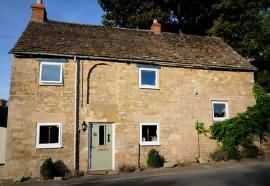 Located in the village of Brokenborough 4 miles fromTetbury and 18 miles from Bath. 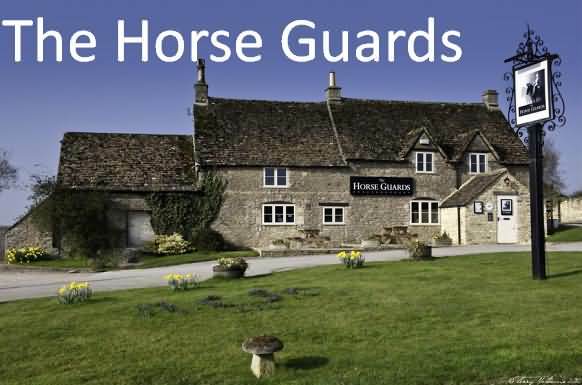 The Horse Guards features a restaurant and free WiFi throughout the property. Guests can enjoy the on-site bar. Very friendly hosts and staff. The delightful large bedrooms are fitted with a flat-screen TV. You will find a kettle in the room. Every room is equipped with a private bathroom. For your comfort, you will find free toiletries and a hairdryer. Bristol is 23 miles from The Horse Guards, and Cheltenham is 21 miles from the property. The nearest airport is Bristol Airport, 29 miles from The Horse Guards. Guests praise The Horse Guards for its exceptional service. This property also has one of the top-rated locations in Brokenborough! Guests are happier about it compared to other properties in the area.